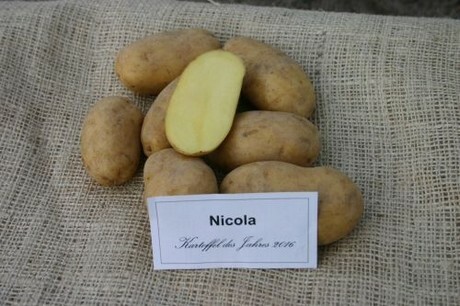 The potato variety Nicola was added to the German varieties list in 1973. Dr. Hans-Jürgen Fitschen (Europlant, previously Saatzucht Soltau Bergen) cultivated the Nicola at the end of the 60s. The Nicola is a relatively early, waxy variety with a long to oval shape. The Nicola is widely popular outside its region of origin, the Lüneburg Heath. The Nicola is a cross between the variety “Clivia” and a wild potato variety. It is a waxy potato with yellow flesh, which is a very sought-after characteristic in potatoes. And the Nicola retains the attractive yellow color after cooking. The taste is mild and the potato has a very fine consistency. The Nicola is regarded as an all-rounder in the kitchen and keeps its nice shape when used as jacket or fried potatoes. For the farmers it is important to know that the Nicola is an uncomplicated variety; it reaches, even under difficult conditions, a relatively reliable harvest and of good quality. Organic farmers choose the Nicola because it is a strong variety with an excellent taste, even after all these years since the first cultivation. Shortly after the approval in 1973 Dutch potato farmers showed interest in the Nicola and started growing them. And nowadays the Nicola is still popular in Holland. It is cultivated in the Netherlands on an area of approximately 3,500 hectares. Over the years the potato spread from the Netherlands to southern Europe and then to North Africa. Egypt now have some of the largest Nicola stocks. After 30 years, in 2003, the Plant Breeders’ Right for the Nicola ended. That means that the owner, Europlant, no longer holds the rights to the potatoes. Every farmer can grow the Nicola today. A group of "propagators", half of them organic farmers, ensures the preservation of the Nicola variety. The Nicola is currently grown on about 500 hectares in Germany. So, compared to other old potato varieties, the Nicola is doing relatively well, commercially. The “potato of the year” is chosen by representatives of the “potato of the year” group. Ten different organizations, associations and companies belong to this group. Eligible for "potato of the year" are varieties of potatoes, which can be grown without license, because they are older than 30 years. There are hundreds of mainly local varieties. The short list exists of six varieties and the representatives of the “potato of the year” group selects the “potato of the year”. A selection criterion is the previous achievements of the variety, such as a particular resistance or a characteristic taste or - as in Nicola - a special production value for farming. The goal of the award is to draw attention to the great diversity of potatoes, which goes beyond the main varieties. Consumers see in the supermarket only a narrow range of potatoes, about ten varieties. And there are approximately 150 registered potato varieties in Germany. Each with a different taste. The award wants to initiate movement and draw attention to potato varieties that are worth it to be preserved because of their special properties. Old potato varieties are a cultural asset that must be protected. The history of the "potato of the year"
The idea to select the "potato of the year" dates from the time when the potato variety Linda got nationwide attention for the negative consequences of the license requirements. At the end of 2004, the owner of the variety 'Linda' withdrew the potato. After the campaign “Save Linda Group”, the variety was approved again in 2010. 2007 Linda; "Because she has to be saved"
2008 Bamberg potato; "By foodies revered variety"
2009 Adretta; "Significant DDR variety that has survived the fall of the wall"